We seek to be the body of Christ, extending his love and mercy through service in our community and to the utter most parts. 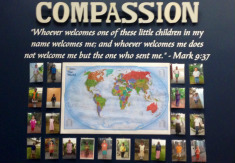 New Haven is proud to partner with Compassion International in changing the stories of children living in poverty. Compassion International exists as a Christian child advocacy ministry that releases children from spiritual, economic, social and physical poverty and enables them to become responsible, fulfilled Christian adults. Today, Compassion helps more than 1.2 million children in 26 countries. Compassion is Christ centered, child focused, church based, and committed to integrity.